John Hay Center > Who was John M Hay? Who was John M Hay? The John Hay Center is dedicated to John Milton Hay, an influential and productive advocate for the people. The Birthplace of John Milton Hay serves as a lasting tribute to his legacy. Hay began his public career as a secretary to Abraham Lincoln. His diary and writings during the Civil War are basic historical sources. He is credited by some as being the author of Lincoln’s letter to the Widow Bixby, consoling her for the loss of her sons in the war. Hay was present when Lincoln died after being shot at Fords Theatre. Hay and his fellow secretary, John G. Nicolay, wrote a 10-volume biography of Lincoln and prepared an edition of his collected works. Hay served several positions and served under five different U.S. Presidents. He held several official positions in Washington including ambassador to Great Britain in 1897. Some of the recognition of the longstanding community of interests between Great Britain and the United States came as a result of Hay’s stay there. 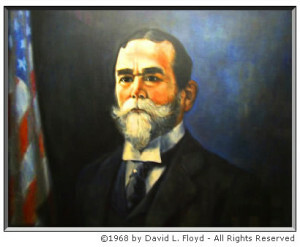 In August 1898, Hay was named Secretary of State and helped negotiate the Treaty of Paris . His contributions included the adoption of an open door policy in China and the preparations for the Panama Canal.